Chen Yifei (1946-2005): China's Restless Romantic | Geringer Art, Ltd.
As a boy in Shanghai, the artist Chen Yifei once leapt from a second floor window holding an umbrella, hoping the wind would carry him gently to the ground Mary Poppins style. In that daring act his nature was already apparent: he had a restless spirit and was prone to taking risks in his quest for meaning. “I have the eyes of a painter,” Chen Yifei once said,”and I always cherish the curiosity of a child for any beauty in life.” Prone to challenging expectations and blurring boundaries, he became an internationally renowned artist whose works over time reflected both the political role of artists in China during the Maoist era and, later, explicit fantasies of feminine beauty that reflected his admiration for Western Realism. The son of a chemical engineer and an artistic mother, in 1965 Chen Yifei became one of the first graduates of the a recently established art academy—The Shanghai Oil Painting and Sculpture Institute—where the Western tradition of oil painting was being taught. By the age of 19 he had become a “Revolutionary Socialist Artist,” who adeptly painted the realist political images that the era demanded. After having painted many large scale portraits of Chairman Mao he became the favorite painter of Mao’s wife, Jiang Qing. 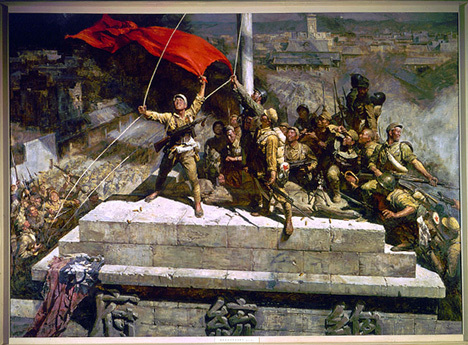 Artistically facile and capable of producing large complex historical works, Chen’s operatic scenes of revolution soon made him the leading state painter of the era. Then, the tide turned: as the Cultural Revolution unfolded he was denounced for “recidivist tendencies” in 1972, he returned to teach painting in Shanghai, laying low as the Cultural Revolution took its course. 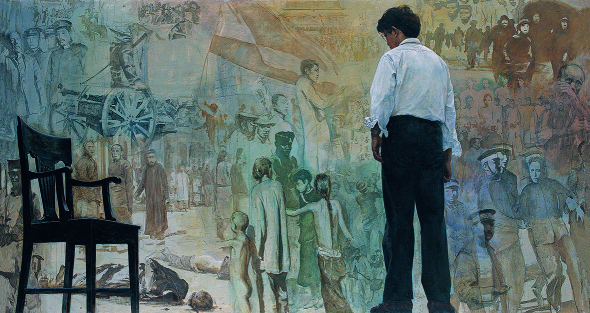 Chen Yifen re-emerged in 1979 with his remarkable canvas “Thinking of History from My Space,” in which the artist’s self-portrait is set against the historical background of the “May 4th Movement” of 1919. The implications of the picture—that the artist was re-examining China’s modern history from a personal point of view—reflects his feelings of introspection and emancipation. His need to re-consider his relationship to Communist politics also had roots in tragedy as his parents had perished during the Cultural Revolution. Chen’s work in the United States reflected his nostalgia for China. 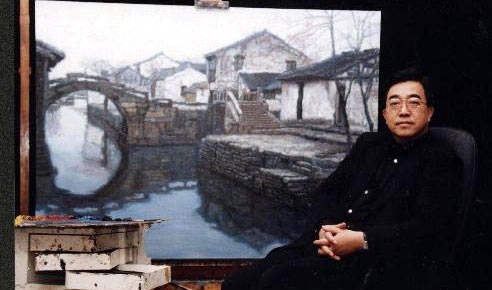 His 1984 oil “My Hometown in Memory,” showed the twin bridges of Zhouzhang where he had spent his earliest years. 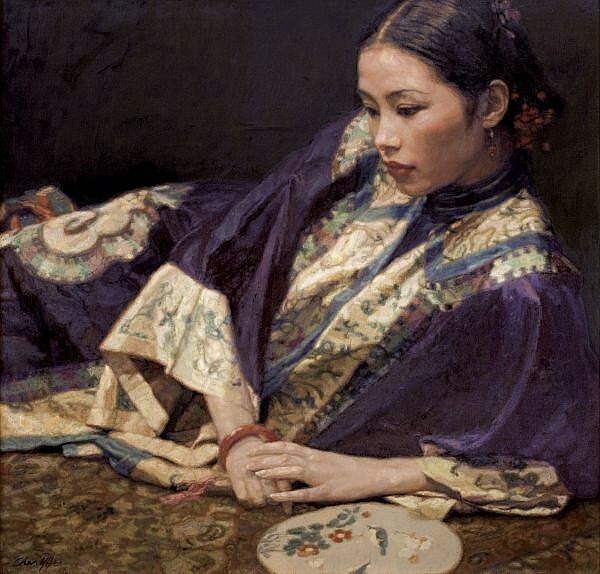 When exhibited in the Hammer Gallery—owned by the oil magnate and art collector Armand Hammer—it brought attention to Chen Yifei’s abilities. A commentary in Art News magazine titled “Challenging Western Fashion,” singled out his work and Armand Hammer later presented “My Hometown in Memory” to China’s leader Deng Xiaoping as a gift. 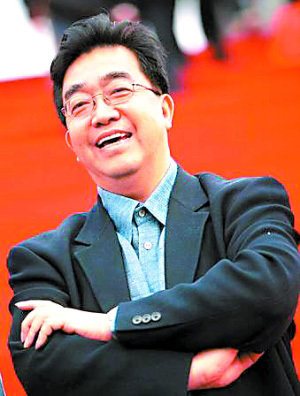 By the time Chen Yifei returned to China in 1993, he had achieved enormous critical success and recognition, and his Romantic style had been established and perfected. Along with images of Tibet that resulted from a trip, he began to develop what would become his most ambitious project: a series of images of women, attentively and exquisitely portrayed. His Chinese women—richly and traditionally attired—were alluring and passive, while his Western models often played musical instruments. In all cases, his lovely women present a kind of distance: an other-worldliness or even nostalgia. One influence on this series is likely the images of the Mater Dolorosa (Grieving Mother) that he had seen as boy while attending church with his Catholic mother.